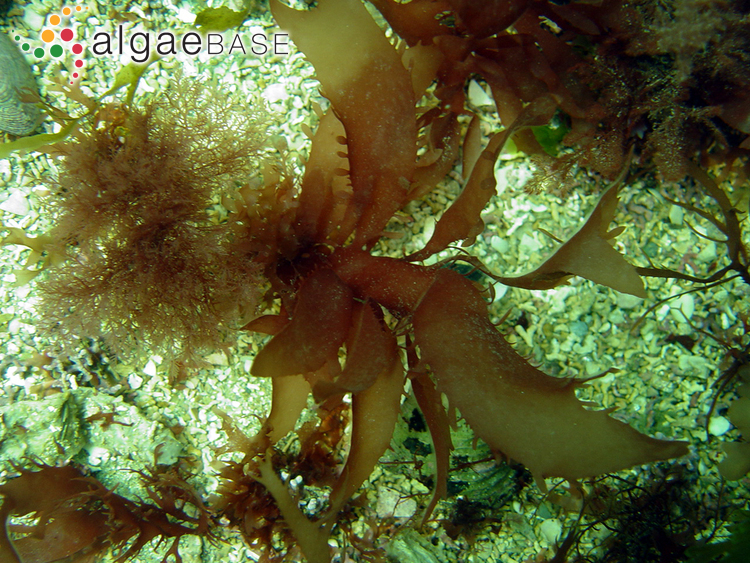 Calliblepharis jubata, lower intertidal, RÃ­a de A CoruÃ±a, Galicia, Spain, 2013, Ignacio BÃ¡rbara. Ignacio Bárbara. © Ignacio Bárbara (barbara@udc.es). Galicia, Ría de Vigo, 2011, subtidal. 24 Oct 2011. Ignacio Bárbara. © Ignacio Bárbara (barbara@udc.es). Portugal, North of Viana, 2009. Ignacio Bárbara. © Ignacio Bárbara (barbara@udc.es). 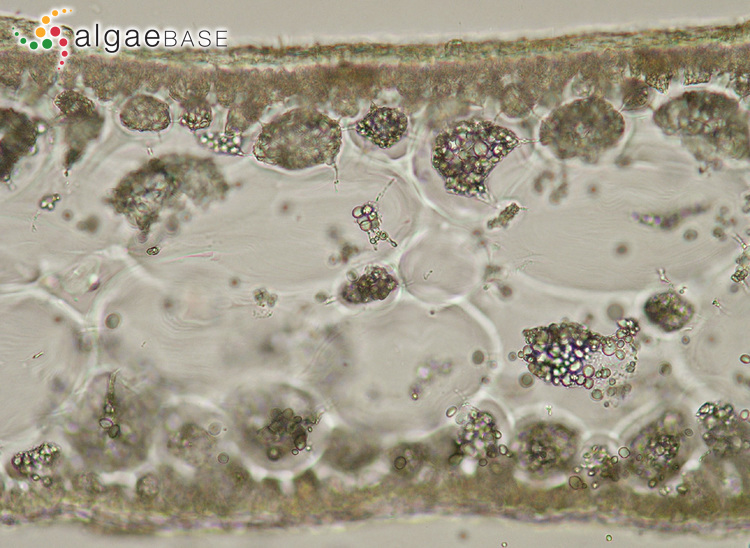 microscope, TS frond showing cortex and medulla and floridean starch grains and pit connections; Spain, Galicia, Ría de Ortigueira, 2006. Ignacio Bárbara. © Ignacio Bárbara (barbara@udc.es). Dog's Bay, Roundstone, Co. Galway, Ireland; plants at low water on sandy rocks. 27 Apr 2006. Michael Guiry. © Michael Guiry (mike.guiry@nuigalway.ie). New Quay, Co. Clare, Ireland; plants at MLWS. 29 Mar 2002. Michael Guiry. © Michael Guiry (mike.guiry@nuigalway.ie). Finavarra, Co. Clare, Ireland; lower-shore pools; with stalked anemone. 11 Aug 2002. Michael Guiry. © Michael Guiry (mike.guiry@nuigalway.ie). Finavarra, Co. Clare, Ireland; lower-shore pools; to 120 mm long. 11 Aug 2002. Michael Guiry. © Michael Guiry (mike.guiry@nuigalway.ie). This is the type species (lectotype) of the genus Calliblepharis. Type locality: England (Dixon & Irvine 1977: 193). Lectotype: An unlocalised, undated Hudson specimen accepted provisionally as of lectotype status (Dixon & Irvine 1977: 193). 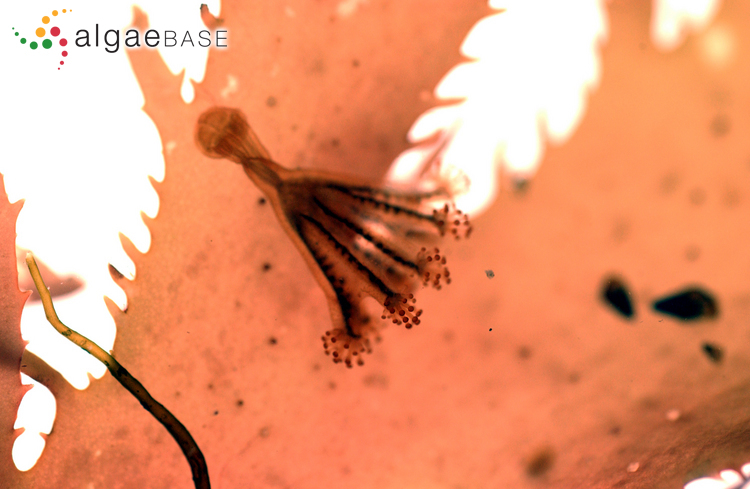 English: Beautiful Eyelash, Red Fringed Weed (Bunker et al. 2010). 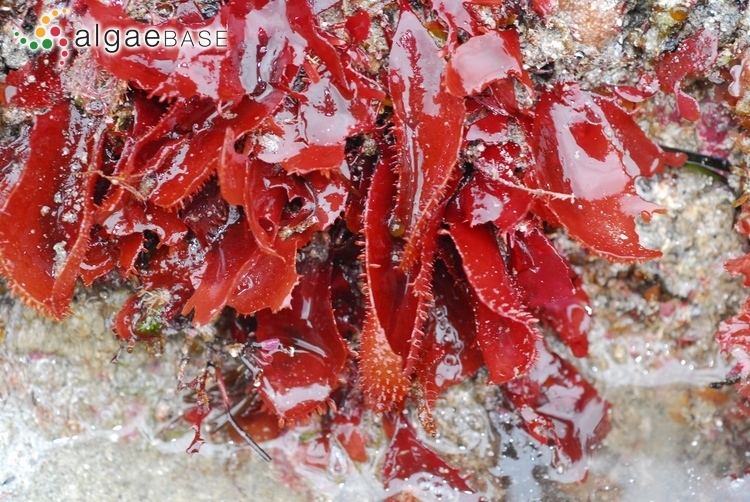 Flattened, subcartilaginous, purple-red fronds, to 300 mm long and 20-70 mm wide, lanceolate or forked, irregularly pinnate; when mature (in summer), the margins and the surface are covered with short, stiff proliferations. Short cylindrical stipe arises from creeping, branched holdfast. 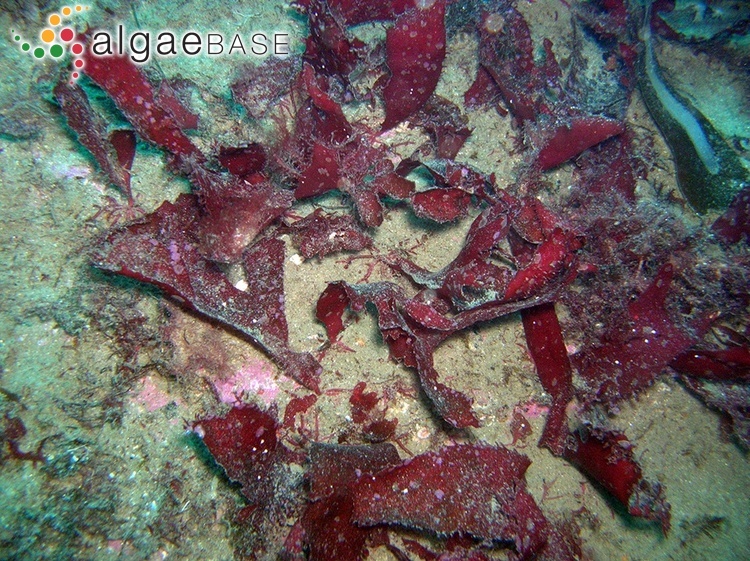 Larger lower intertidal pools and subtidal (0-25 m) on stones, maerl and shells, widely distributed, common in south and west, sometimes frequent in drift; occasionally abundant on bedrock below the lower limit of kelp. 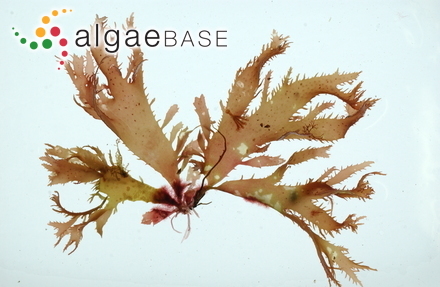 Calliblepharis jubata is narrower (to 10 mm); its marginal outgrowths are long, branched and entangled, and it is mainly intertidal. Dixon, P.S. & Irvine, L.M. (1977). 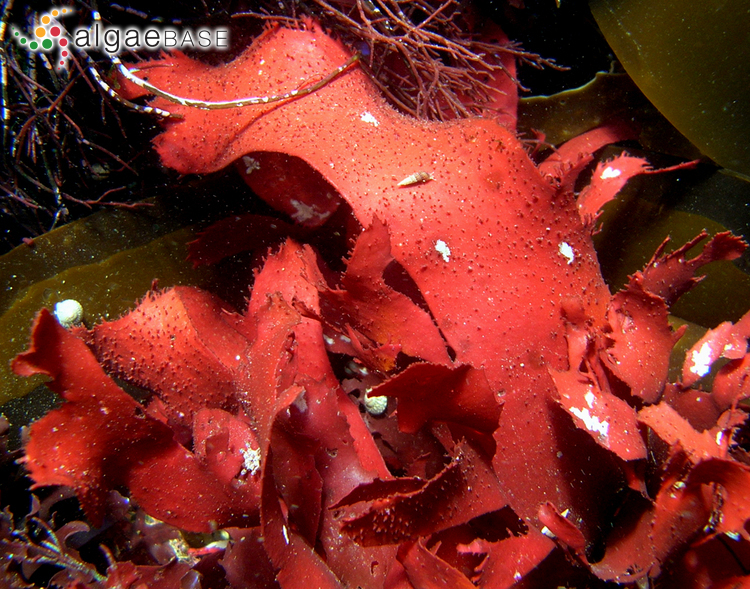 Seaweeds of the British Isles. Volume 1. Rhodophyta. Part 1. Introduction, Nemaliales, Gigartinales. pp. [i]-xi, -252, 90 figs. London: British Museum (Natural History). Accesses: This record has been accessed by users 8687 times since it was created. Molenaar, F.J., Venekamp, L.A.H. & Breeman, A.M. (1996). 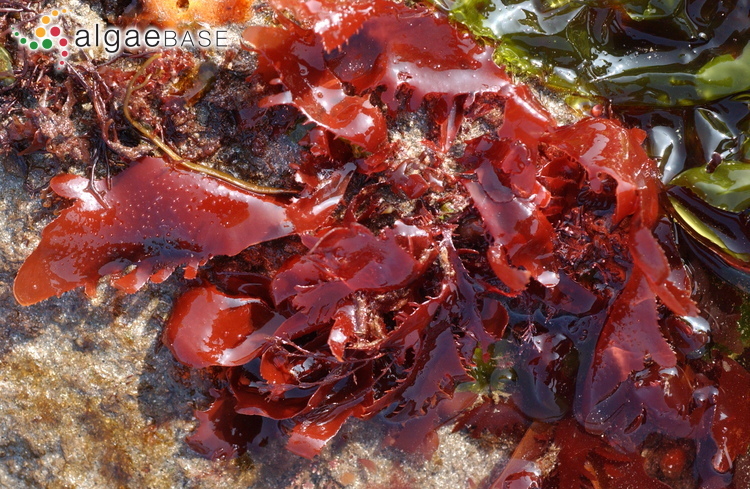 Life-history regulation in the subtidal red alga Calliblepharis ciliata. European Journal of Phycology 31: 241-247, 5 figs, 3 tables.